Yesterday I released a new book, On A Dark Wave, Floundering, without any fanfare. I’ve been quiet about this particular project, partly because I didn’t want to overshadow the launch of Novis, but also because the subject matter of this book is intensely personal. 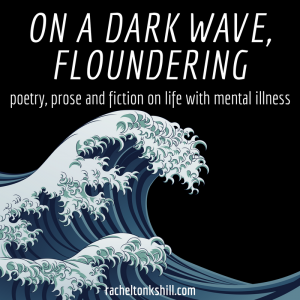 On A Dark Wave, Floundering is a collection of poetry, essays and fiction based on my experience living with mental illness. And I chose to release it yesterday, February 4th, because yesterday was a very special anniversary. You see, on the 4th of February 2017, I decided I was going to kill myself. As you can tell, I didn’t go through with it in the end, but almost every moment of the year that followed was shaped by that decision, and what led me to make it. I’ve been quiet on my mental health for the past year, not because I am ashamed of my mental illness, but because I haven’t felt ready to talk about it. I felt that before I could say anything I had to make it a year, and with the first anniversary having recently passed, I’m breaking my silence. I’m breaking my silence because I care about ending the stigma surrounding mental illness by being open and honest about my own. And because I want anyone else who might feel the way I did a year ago to know they’re not alone, that I’m here for them if they need me and I know what they’re going through. I’m breaking my silence because I want people to know it can get better. I got the help I needed a year ago: from family, friends, my doctor and counsellors. I’ve found new medication that really makes a difference, I’ve learned a whole bunch of coping mechanisms and I’ve managed to quit the self-harm I’d been struggling with since before February 2017. Slowly but surely, I started to recover, and the first anniversary of surviving is a major milestone that warrants celebration. Every single one of the pieces in this book has been written in the first year of my recovery from that awful place. Every single one of the pieces in this book has been part of that recovery. These pieces talk very frankly about my depression, my anxiety, my suicide ideation and my mental health. On A Dark Wave, Floundering isn’t a self help book, it doesn’t contain useful advice on how to get yourself out of that situation. I’m not a medical professional. I’m not a counsellor or a psychologist or a psychiatrist. So I wrote about my experiences, how it felt to be in that situation, how it felt as I recovered, what mental illness felt like for me. This book is, in places, a howl into the void, primal and unrelenting. But I’m sharing it with you, sharing my pain with the world in the hope it that it might make a difference to someone who really needs it. Because not everyone is as lucky as me. Not everyone makes it this far. And I’d like to do what I can to change that.